This year may be remembered as the year when socially responsible investing (SRI) in the United States made the leap from a sizable, but relatively uncommon, investment option to an indispensable portfolio element. Throughout 2017, the growing and inescapable public role of America’s private corporations has been brought into clear focus with business leaders thrust into the spotlight to speak on urgent issues from the treatment of women and minorities, to immigration, income inequality, and climate change. In early January, BlackRock intensified the focus on investor stewardship, with CEO Larry Fink noting in his 2018 annual letter to CEOs that “Society is demanding that companies, both public and private, serve a social purpose.” With “many governments failing to prepare for the future,” Fink reinforces the need for companies to do the right thing for workers, customers, and the communities in which they operate. Even activist investors – better known for their cost-cutting zeal and love of leverage than for their environmental and social stances – have started entering the fray. In January, Jana Partners announced the launch of a new Impact Capital fund and promptly teamed up with the California Teachers’ Retirement System to engage Apple with regard to smartphone addiction in children. The arrival of activists pursuing a societal, rather than a traditional, purely shareholder-focused agenda has the potential to significantly intensify the debate. Activists have perfected the art of engaging management teams and boards of directors, pursuing shareholder resolutions, and effecting change. How adroitly they can integrate a newfound social agenda with the established shareholder value-creation approach may have a significant impact on the future of corporate America. Changing demographics are one factor behind the shift towards SRI. A recent survey found that 86 percent of millennial investors are interested in sustainable investing and that 38 percent are “very interested,” a 10 percentage point increase compared with the prior year. The great millennial generation wealth transfer, estimated by Accenture to be near $30 trillion over the next several decades, will accelerate the need for reliable data and socially aware investments. So why are investors just catching on? A major reason is that there has been a dearth of reliable data to show that investing in these issues is beneficial to a company’s bottom line. Additionally, there hasn’t been a clear yardstick for corporations to use in measuring where they stand overall. Recently released analysis from JUST Capital, an independent research organization, sheds light on both of these questions. In December, JUST Capital released its second annual ranking of the largest publicly-traded U.S. companies, assessing how well their business practices align with the priorities of the American public. 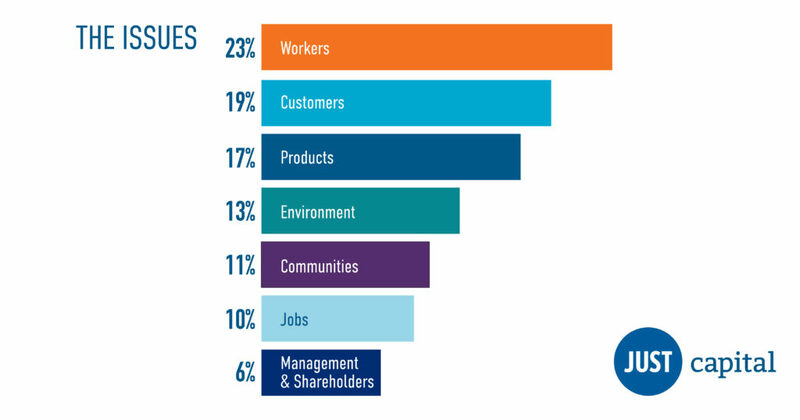 These include worker pay and treatment, product quality, customer respect, and other issues that Americans care most about according to our survey. We found that the top 100 ranked companies pay their median U.S. worker 33 percent more than other companies in the Russell 1000, are more than 10 times likelier to have conducted gender pay equity analyses, and face 74 percent fewer employment discrimination cases per dollar of revenue. Our research also shows that these companies outperform competitors. Over the past five years, these 100 “just” companies delivered a 24 percent average ROE, significantly higher than 16 percent for other ranked companies. This record of outperformance is also supported by the JUST U.S. Large Cap Diversified Index (JULCD), which was launched in November 2016 and recently marked its successful first year of live trading. The Index meets the pressing need for an equity market benchmark reflecting the values of the American public without sacrificing investment return. Companies in that index exhibited significantly higher returns, lower volatility, shallower stock price declines, and higher return on investment capital than bottom-ranked companies. 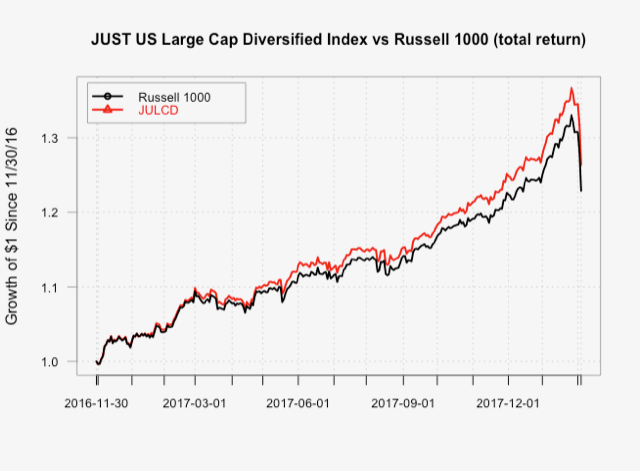 In live, out-of-sample performance through February 5, 2018, the JULCD Index has since inception also surpassed the Russell 1000 by over 3 percent with minimal tracking error. It has continued to outperform over the current period of heightened market volatility. In an effort to create more relevant and transparent data for socially aware investors, JUST Capital will track the stock performance of the overall leaders of its rankings, alongside indices tracking specific issues such as worker treatment and environmental performance. To be sure, this shift towards SRI and sustainable, or ESG, investing is still in its beginning stages. According to the Global Sustainable Investment Alliance, in 2016 U.S. SRI assets accounted for nearly $9 trillion, or 22 percent of U.S. assets under professional management, up from 18 percent in 2014. Getting to a 25 percent share in the U.S. – less than half that of Europe’s, currently at 53 percent – would imply well over $1 trillion in fresh, and potentially near-term, investment flows. Of course no investment strategy can guarantee outperformance in perpetuity, but the new investor imperative must place corporate social responsibility at the forefront. This shift has the potential to yield not only stronger financial performance, but also a more just economy – where the issues that presently vex our society are responsibly confronted by America’s corporate leaders.